As I write this, Southern California is experiencing a Pineapple Express, meaning we’re seeing the kind of rain that this part of the world is famous for not ever having. But as evocative and romantic as the term Pineapple Express may be, I’m choosing to write instead about a different weather phenomenon. It’s my word of the week. pogonip (PAHG-eh-nip) — noun: 1. a dense winter fog containing ice particles. 2. a frozen fog, formed in the coolest weather in the mountain valleys of Idaho, Nevada and Colorado, that often causes severe pulmonary trouble when inhaled. According to Wikipedia, the word entered the American English lexicon when English-speaking settlers started arriving in what become the western United States. Never having before witnessed these banks of opaque, sparkling fog, they borrowed the Shosone word for “cloud,” payinappih and rendered it as pogonip. Though the combination of conditions that create pogonip would rarely occur — near 100 percent humidity as the temperature drops to −40 degrees Celsius — the phenomenon is apparently not unique to the western U.S. valleys that gave it its name; it also occurs in Alaska and Siberia, where it can be called simply ice fog, which doesn’t sound nearly as fun. 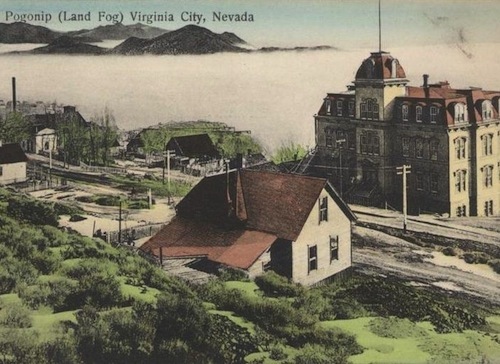 Wikipedia offers this circa-1907 postcard of Virginia City, Nevada, as it’s being beset by pogonip, though the postcard curiously describes it as land fog, which sounds even more boring and which would seem to refer to the fog that occurs unremarkably everywhere. I’m told that I should not confuse pogonip with an even more enticingly named meteorological happening, diamond dust, which sounds like something cast by an ice elf in She-Ra but which apparently really happens — on clear, cold days when sparse ice crystals simply fall from the sky, princess-magic like.